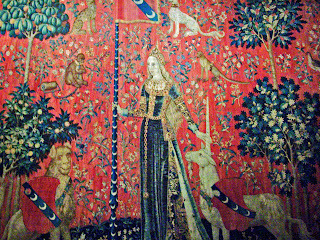 I've been intrigued by the Unicorn tapestries since I read the novel, The Lady and the Unicorn by Tracy Chevalier. While I've seen these tapestries in the past, I never really paid much attention to the details. 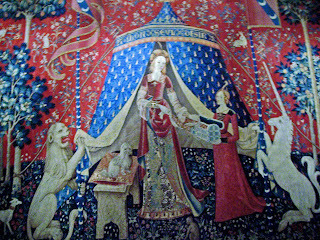 After reading Chevalier's book, I have a better appreciation of these tapestries as works of art. There are six tapestries in all, five of which deal with the senses. The sixth one portays a woman putting away her necklace into a box held by her lady in waiting. Above her, on the tent, are written the words, "A Mon Seul Desir". The lion and unicorn hold back the flaps of the tent. Her poodle sits regally on a silk draped bench to her right. All around are signs of life-fruit trees, flowers, birds, rabbits, monkeys, leopards. 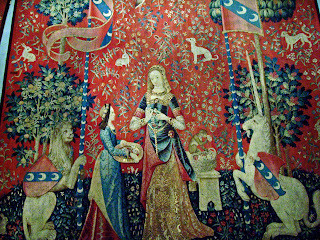 The tapestries were found in the Chateau de Boussac in Auvergne. It was commissioned in the 15th century by Jean Le Viste whose coat of arms are worn by both the unicorn and the lion. It was woven in Flanders from cartons which were designed in France. The tapestry above reflects the sense of smell . It shows the Lady making a flower wreath as the monkey takes a rose from her basket and sniffs it. Behold the unicorn look at himself through the mirror held by the Lady. He is resting his front legs on her lap. 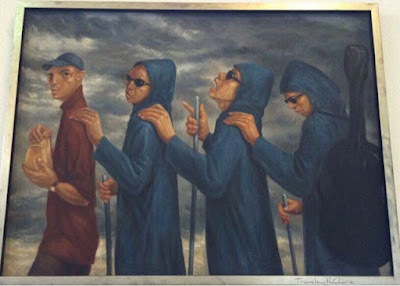 They are sitting on an "island" of blue surrounded by a background of scarlet wool and silk. Notice the discoloration at the bottom of the tapestry which is the result of earlier restoration. The tapestries are now kept in low light to preserve them. 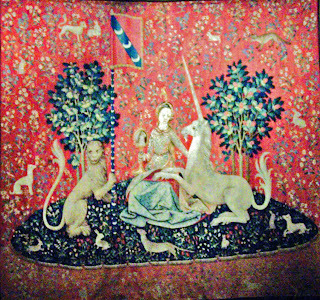 In the tapestry above, the Lady touches the horn of the unicorn with one hand while the other holds the banner with the coat of arms. 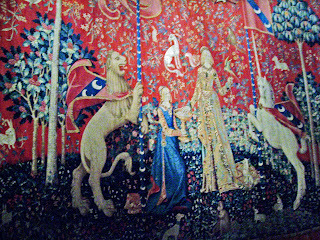 I didn't have much luck taking a picture of "Hearing" as there were children seated on the floor in front of this tapestry. They were learning all about these beautiful tapestries. 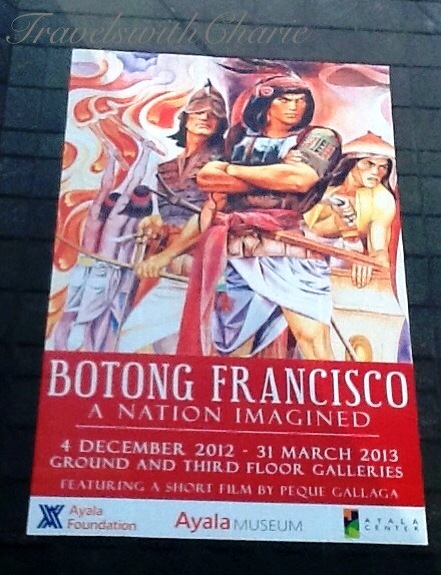 I heard their guide and teacher ask them questions as they tackled the more profound meaning of the tapestries. How wonderful to educate these kids about their heritage at such a young age. I applaud.